This week I did my first ever completely zero waste food shop. 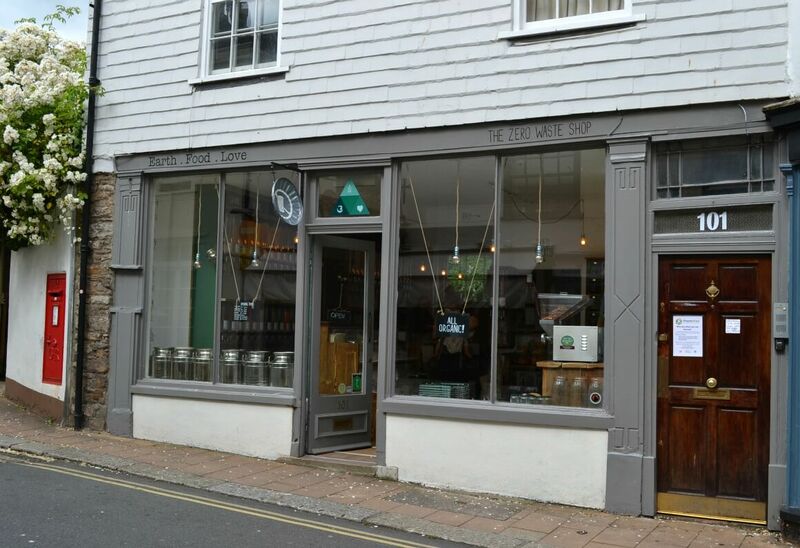 There is a new store that has opened in a nearby town called Totnes. I’ve been meaning to go over there for a while now as I was curious how it all works. 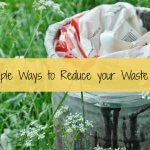 So I dragged my friend and fellow blogger Lynsey from Optimum Frugal, along to check it out. The store is called Earth . Food . Love and is at the top of the high street. 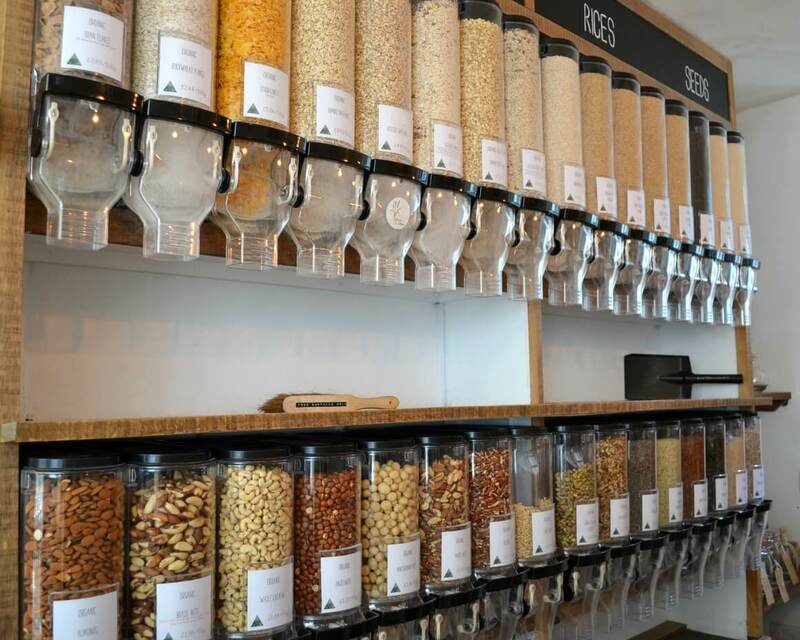 It’s the UK’s only zero waste, organic, bulk-buy, plant-based wholefoods shop. 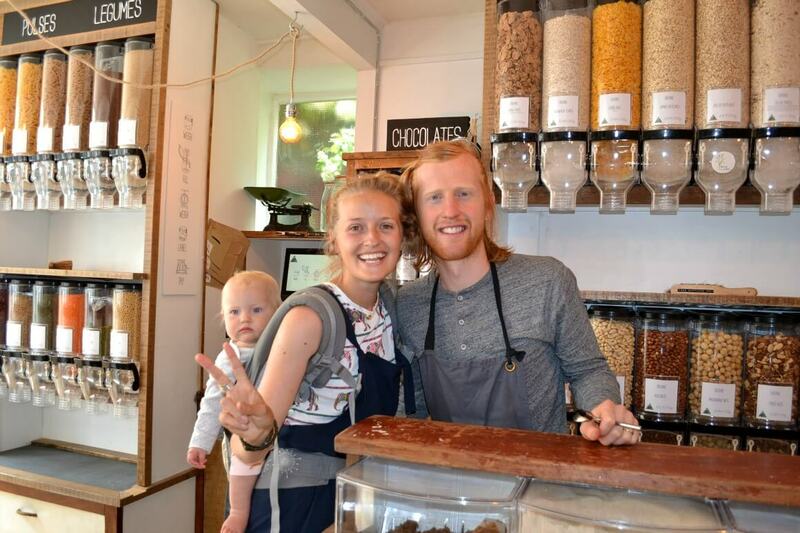 The store is run by Richard and Nicola & their daughter Willow regularly makes an appearance too. They say ‘We have a vision for the kind of world we want our children to grow up in and this shop is helping to make that a reality’. All of the food in the store is organic. I was slightly nervous about visiting their store as I wasn’t quite sure what to expect. In reality, it’s a really simple system. You take along your jars or containers. 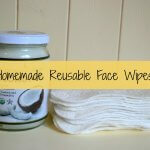 They can be anything from cups, bottles, jars or paper bags. If it can be weighed then it can be used. Tip: If you forget your containers you can use their paper bags which are FSC accredited wood pulp and can be composted. You then need to weigh your containers on the scales provided BEFORE you put anything into them. 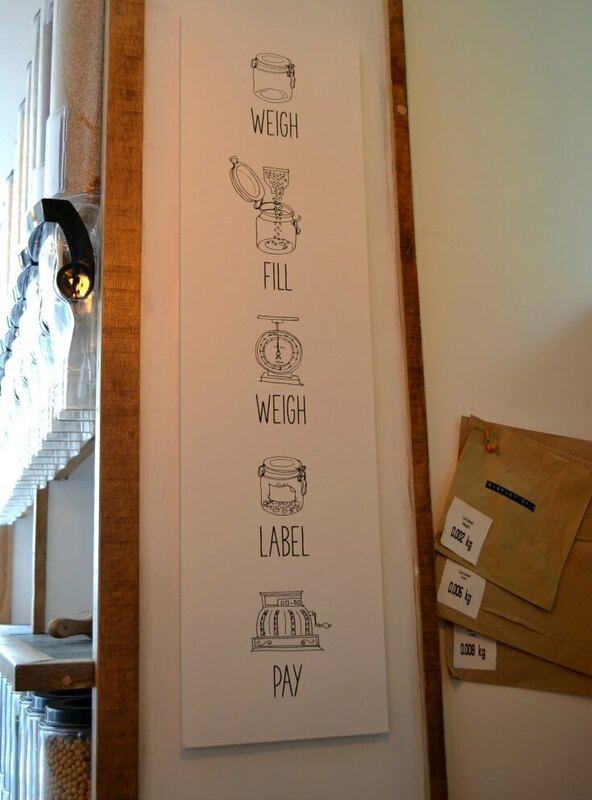 Once you have your container weight you can either print off a label to stick on or in true zero waste style write in on the container with the glass pens they provide. Once you have your empty container weights you fill them up with whatever you need. They then get weighed again by the staff and you pay. Simple! For a full list of the items they sell check out their prices page on the website. The prices were higher than I would normally pay but I don’t normally buy organic. Much as I would love too! I did a quick comparison for their organic plain flour and Tesco’s. 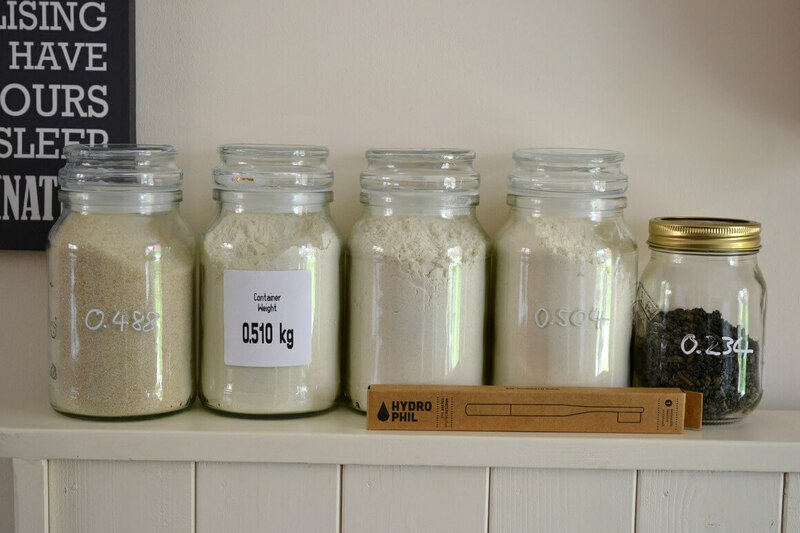 Tesco’s plain flour costs 62p per 500g whereas Earth.Food.Love’s organic plain flour costs 75p per 500g. 13p isn’t a huge difference and with the Tesco one, you would obviously have waste from the packaging. I guess it comes down to what is more important to you as an individual. Although I was nervous to start with I found the whole experience quite exciting. I managed to get plain flour, self-raising flour, caster sugar, gunpowder green tea and my first ever bamboo toothbrush. I’ve been meaning to try them for a while now so I was happy I found that. I did forget to weigh one of my containers before I filled it which was a little annoying but the staff were very friendly and it didn’t appear to be a big deal. 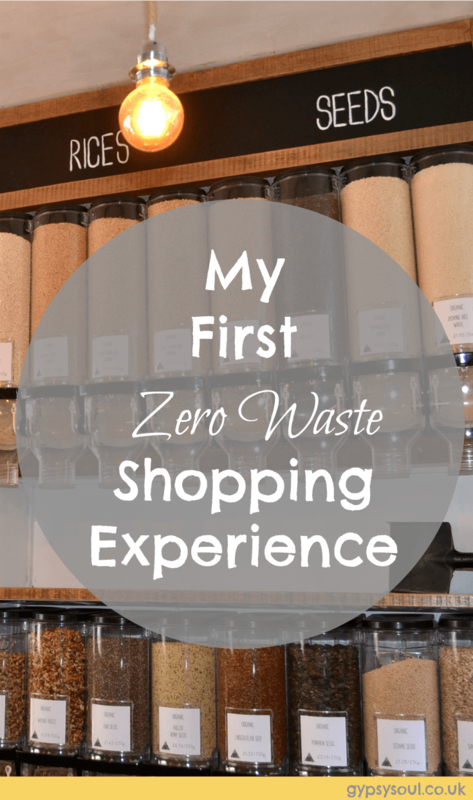 I guess it’s just a case of getting into a different frame of mind for zero waste shopping. If I go to a big superstore my main aim is to get in and out as fast as I can as I hate it. This shopping experience, however, was completely different. A lot more relaxed and fun! We got to sample some of their ‘Grind your Own’ peanut & almond butter. I personally loved the almond butter and would definitely recommend it. Would I go back to this store? Absolutely! Take a strong bag to carry your goods or better yet invest in one of those pull along trollies. You know like the ones your Gran has. They may not be ‘cool’ but they will save your back. 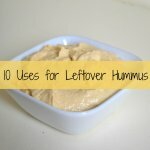 Make sure you have packed all of the containers that you will need. Make a list so you don’t get distracted by all of the lovely things on display and come out with more than you intended too. 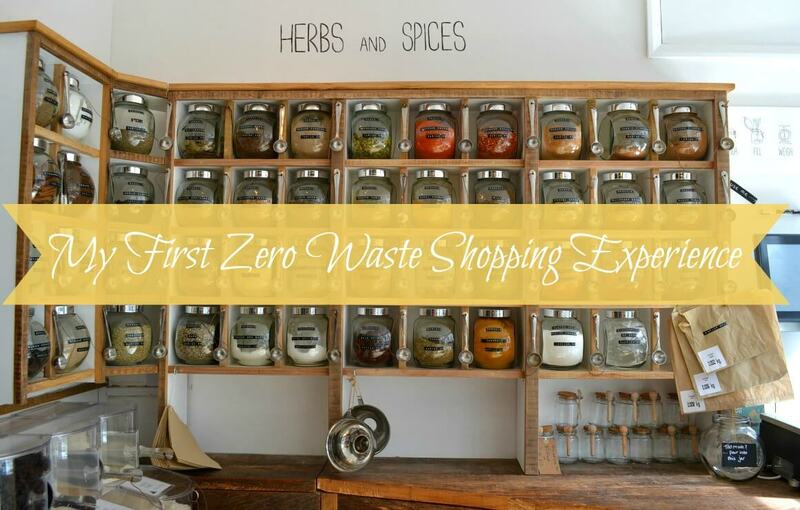 If you are interested in zero waste shopping then why not download my free zero waste toolkit here. 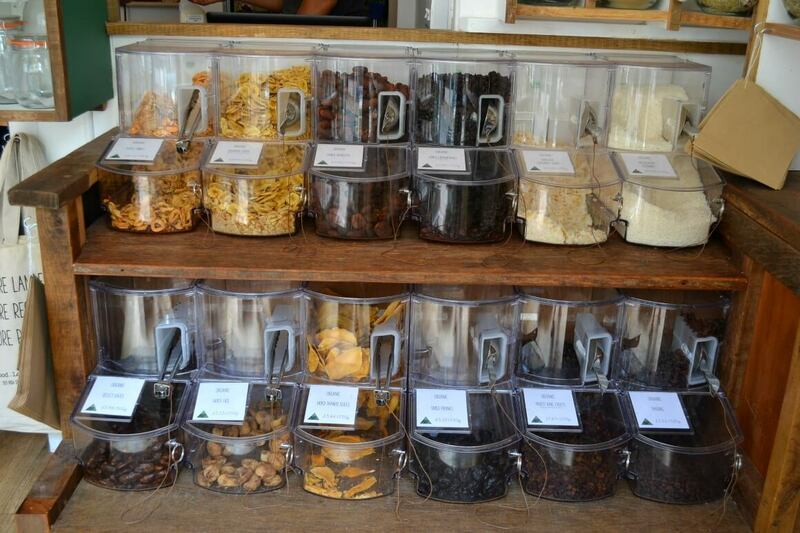 My local health-food co-op has a bulk department very similar to this shop! 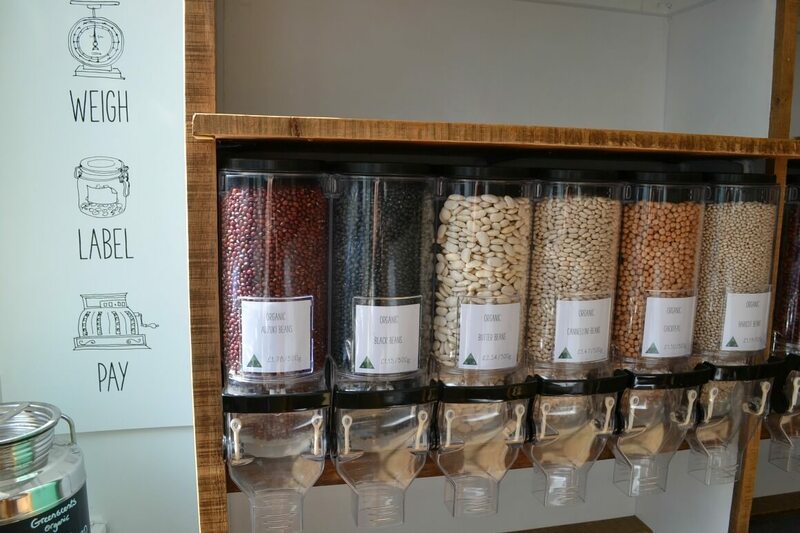 (It also sells packaged foods and ready-to-eat foods and drinks that you can put in their washable dishes to consume on-site or in your own containers or disposable containers to bring home.) Here is my guide to bulk buying. 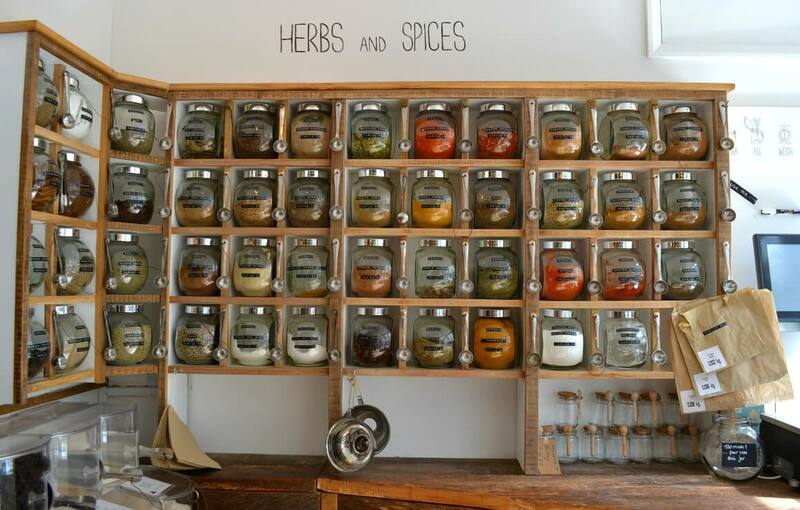 Some things actually are priced much lower there than in other local stores–especially spices! I wish more places around here would have sell loose bulk buy items. I remember it being pretty common when I was younger. I don’t know why it changed. Yay! Love shops like this. 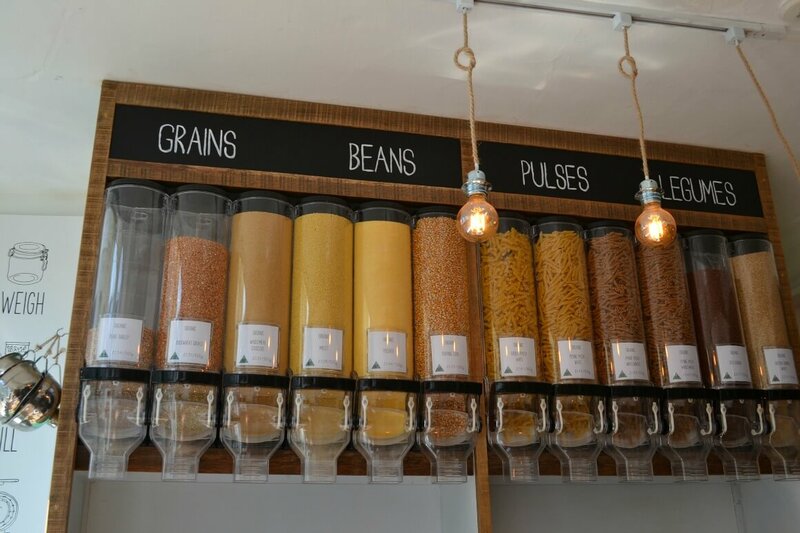 Have you seen that the new Real Food Store in Exeter has dispensers for bulk foods too? No, I haven’t seen or heard of it. Where is it in Exeter? I’d love to go along and check it out. Can you recommend where to buy big glass storage jars? 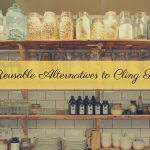 There are loads of places to buy glass storage jars. Are you in the UK? If so and you want to buy them on the high street then Wilkinsons might be a good option. A lot of supermarkets now have them in their homeware departments too. If you want to buy them online then Etsy has a good selection – http://tidd.ly/40c55902 They are all independent businesses rather than big chains. If you don’t mind buying second hand then check out the charity shops. I’ve got most of mine that way and they are usually a lot cheaper than the other shops. If they don’t have any on display always ask if they have some in the back as they don’t always put them out. Another option is to put a request out on the free sites such as Freecycle. I’ve also got some that way in the past. I hope that helps Joana? Hi, I enjoyed reading about your visit to the Totnes ZW store. 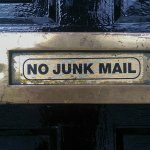 We have a new Zero Waste Exeter facebook group. In order to raise ZW awareness, if you are based in or around Exeter please can you join the group and also share on your blog and facebook page? 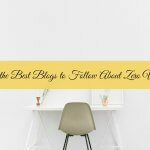 We will happily promote your blog and articles on there!